Today's bunting idea sprang to life as I was moving office clutter to the trash bins in the garage. 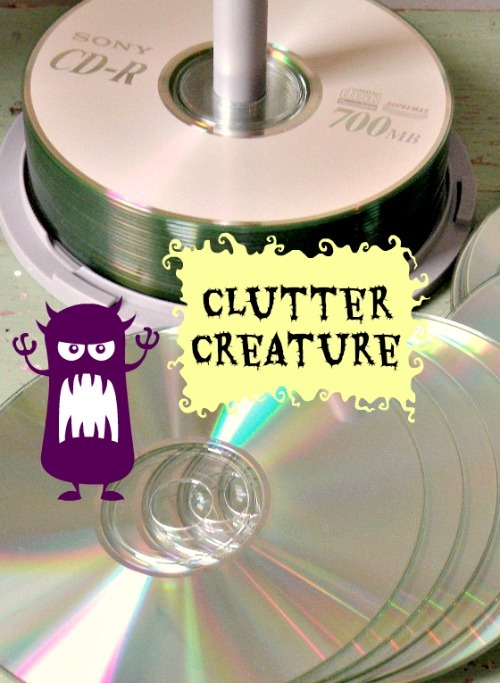 These old CD's and DVD's have been clogging up my office drawers and glove compartment for years! I finally threw this shiny stack in the recycle bucket this morning. Good riddens! But as I headed out of the garage, past the charity donation pile, the summery blues of my husband's cast off dress shirts caught my eye! Suddenly, visions of pin stripe buntings danced into my head! I would need those CDs after all! 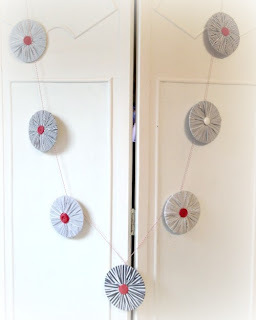 With a few additional sewing supplies, I was ready to roll out some bunting! 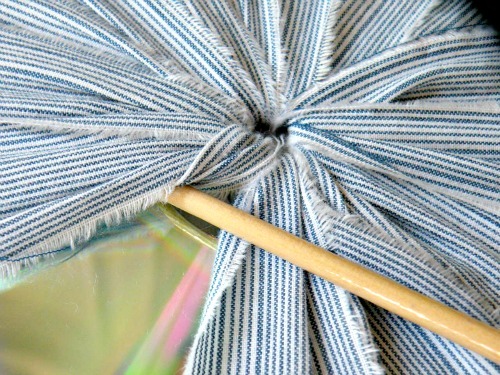 Each CD will need 3 strips of fabric approximately 1.5-2 inches wide by at least 12-18 inches long. 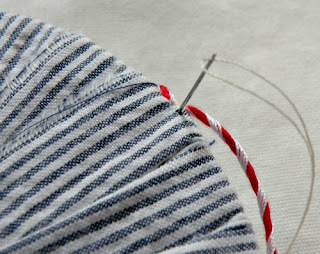 The longer the strip the better, but when using scraps cut from garments getting consistent lengths can be difficult. I used the ripping method (cut a small start line and rip fabric instead of cutting entire strip with scissors). This leaves a soft, natural edge on the fabric. Insert a strip through the CD's center hole. 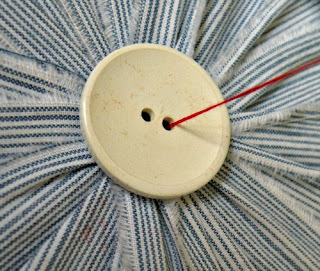 Use a finger to hold down end of starter ribbon and begin wrapping fabric strip around top of CD and back through center hole. 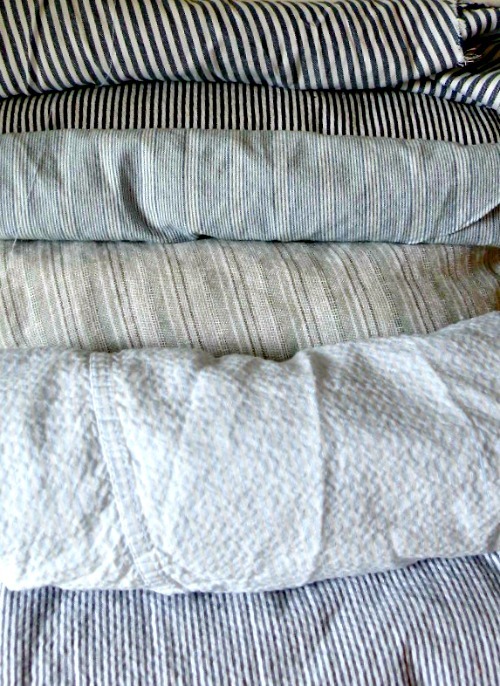 Continue wrapping in a counter-clockwise direction, overlapping the previous layer each time. 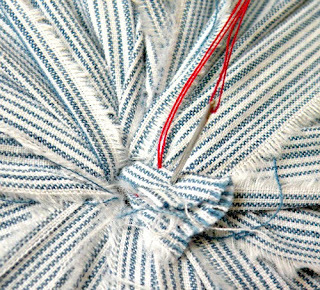 As the fabric thickens in the center, use the pointy end of skinny paintbrush to assist in poking fabric through the center. Tuck the strip end under the previous layer, using the paintbrush handle to secure in place. Start the next strip on top of the on top of the previous end. 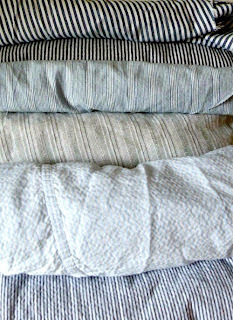 Wrap over tucked layer for extra coverage. 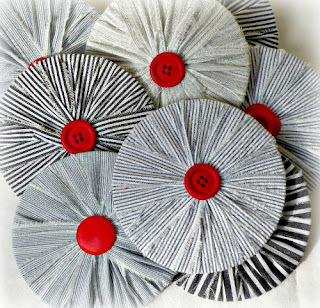 Once the CD has been covered in fabric, use a needle and thread to attach button centers. 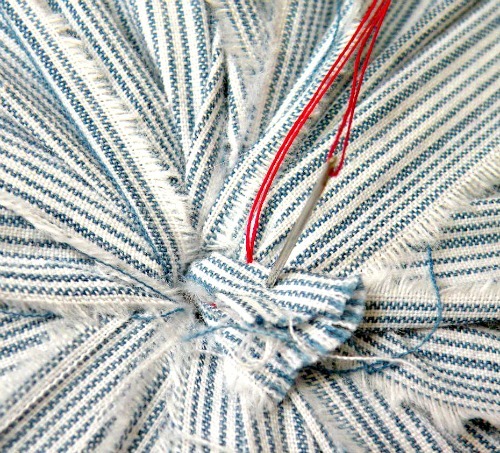 Start with a stitch to hold the last tuck in place at center. With chosen button in center , stitch the button to the CD with stitches that go through to reverse side of the hole. 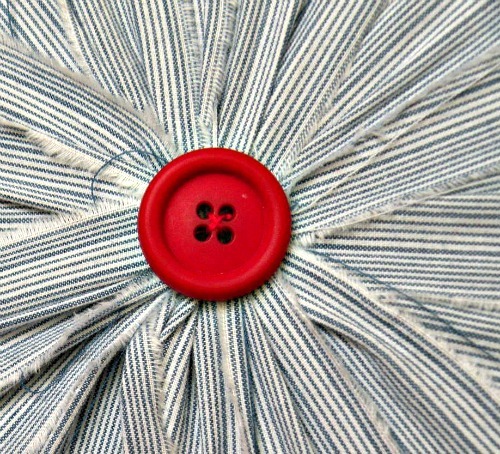 On reverse side, secure a second button over center to hide stitches. 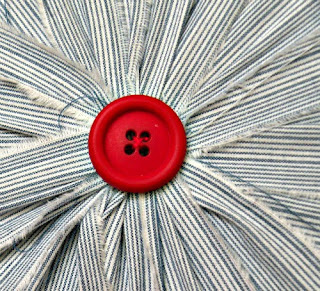 Secure to button on front by stitching through CD center hole, through front button holes, and through back button holes. 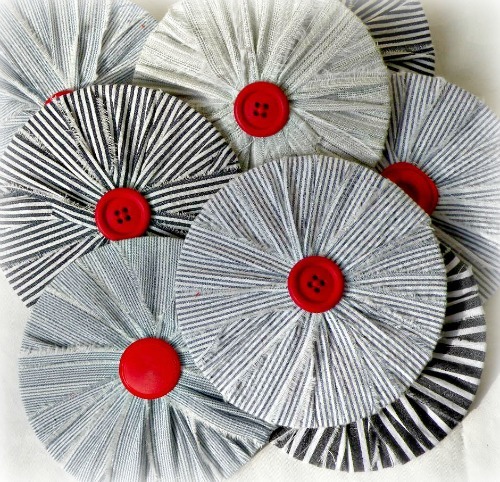 Essentially sewing button to button like a CD sandwich. Continue until both buttons are secure. 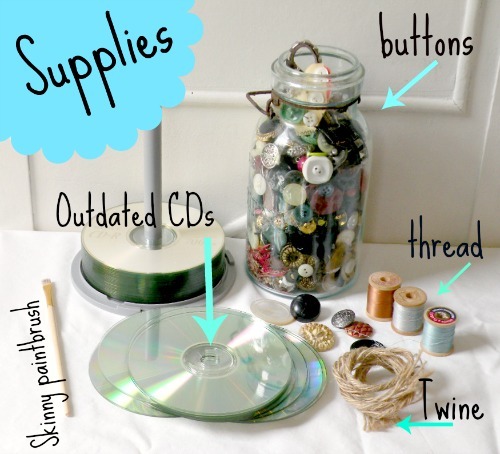 Once all the CDs are finished they are ready to be attached to the twine. Using a loop stitch, attach the CD to the twine. 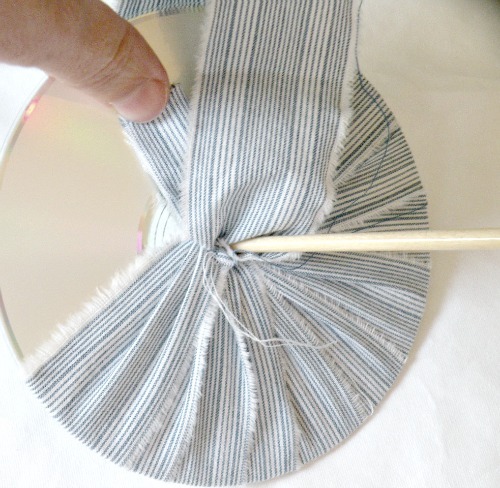 Reinforce loop by stitching at least three repeat loops on each CD. 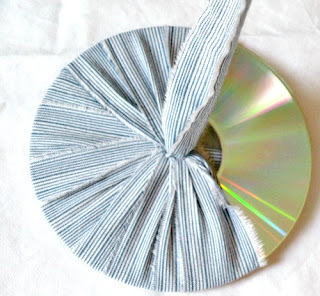 From the stitched location on the twine measure out 10 inches and attach the next CD. Continue doing this until all the CDs have been attached. Now your office drawers are freed up, those corporate power stripes have been softened up, and your fab new bunting is ready for showing off!